Have you ever sat there while your boss stands over you, desperately searching for that missing document he or she needs RIGHT NOW? Or have you kept a client waiting on the phone for several minutes while you’ve searched for a status report? If you have, then however organized and effective you are in your day-to-day work, your boss and your client may have a less than perfect opinion of you, because in a key encounter, you’ve let them down. And if it’s your job to help people, how much of other people’s time are you wasting if you can’t find the information you need when you need it? You owe it to yourself to file effectively, however boring this may seem. Imagine how much more impressive it would have been if – when asked – you’d smiled, accessed a well-organized filing system, immediately found the document, and quickly given the answer! On a typical work day, we deal with many documents, presentations, graphics, and other files. There’s a flurry of data pouring in from all directions that we need to process and, usually, store to retrieve later. We want to be able to lay our hands on the information we need – at the right moment, when we need it – so it can be used for further analysis or report writing, or perhaps for creating a presentation. All too often, though, we waste our own time (and often the time of other people) searching for data that’s sitting on the very computer we’re using! This adds to our stress, and makes the task of putting the data to use more difficult than it ought to be. So we need to get more organized and efficient with our file management if we’re going to get our work done in a timely manner. When you receive a file in an e-mail from a co-worker, vendor, or customer, it’s tempting to “just put it away” in some folder for the time being. “Hmm. looks interesting, but I’ll take a closer look at this later, when I’ve got more time.” Sound familiar? Or, worse still, perhaps you just leave the message and its attachment sitting in your Inbox. After a while, many such documents build up, leading to a lot of clutter. It’s highly unlikely that you’ll ever find time to go back and get all of that information organized, especially considering that you’re usually under pressure with other things. You can spend hours of precious time searching for data you’ve filed away somewhere, because it’s easy to forget the filename – or even to forget that such information is on your computer in the first place. So how can you go about simplifying your work? Get better at managing files. Managing files on your computer isn’t much different from the way you’ve always stored and managed your paper files. It boils down to this: store the information in folders – by category, and in a sequence that makes sense to you. 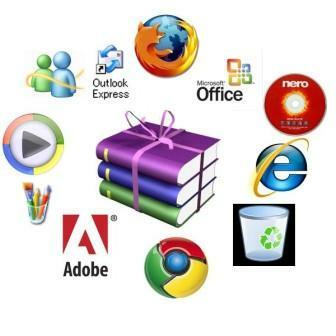 Avoid saving unnecessary documents. Don’t make a habit of saving everything that finds its way into your Inbox. Take a few seconds to glance through the content, and save a file only if it’s relevant to your work activity. Having too much data on your computer adds to clutter and makes it harder to find things in the future – and it may, over time, slow down your computer’s performance too. Be selective about what you keep! Follow a consistent method for naming your files and folders. For instance, divide a main folder into subfolders for customers, vendors, and co-workers. Give shortened names to identify what or whom the folders relate to. 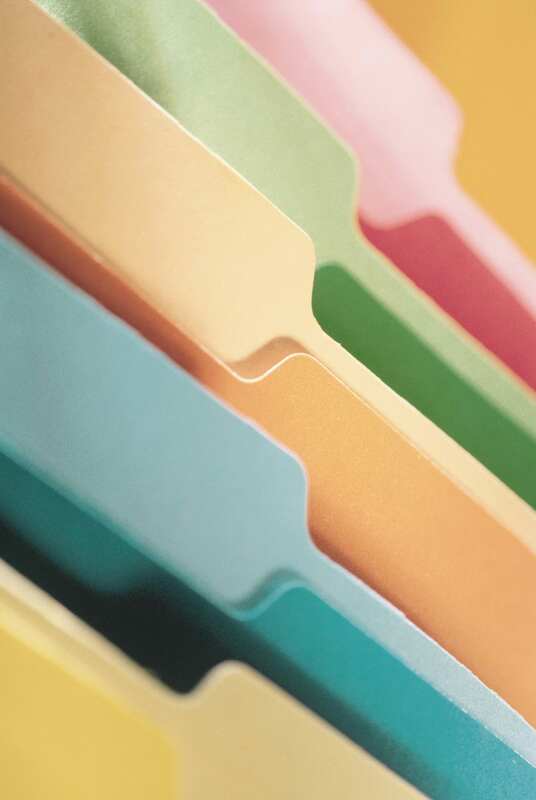 What’s more, you can even give a different appearance or look to different categories of folders – this can make it easy to tell them apart at first glance. Store related documents together, whatever their type. For example, store Word documents, presentations, spreadsheets, and graphics related to a particular project in a single folder – rather than having one folder for presentations for all projects, another folder for spreadsheets for all projects, and so forth. This way, it’s much quicker to find, open, and attach documents for a particular project. Separate ongoing work from completed work. Some people prefer to save current or ongoing work on their computer’s desktop until a job is completed. Then, once it’s done, they move it to the appropriate location, where files of the same category are stored. At periodic intervals (for example, weekly or every two weeks), move files you’re no longer working on to the folders where your completed work is stored. Avoid overfilling folders. If you have a large number of files in one folder, or a large number of subfolders in a main folder – so many that you can’t see the entire list on your screen without scrolling down – break them into smaller groups (subfolders or sub-subfolders). Think of creating a sequential menu, arranged either in chronological or alphabetical order, to make retrieval easy. For instance, you can divide a folder called “Business Plan” into subfolders called “BP2008,” “BP2009,” and “BP2010.” Likewise, you can divide a folder for a client named Delta Traders into subfolders named “Delta Traders sales presentations” and “Delta Traders contracts.” The idea is to place every file into a logical folder or subfolder, rather than have one huge list of files. Having said this, there is usually little point in creating a folder for fewer than about five documents. If you do, the time you spend clicking through subfolders to get to the documents you need may not be outweighed by the greater ease of finding them. Install Google Desktop on your PC. If you can (sometimes IT departments don’t permit this), install Google Desktop on your PC – you can find this at http://desktop.google.com. This neat tool creates a desktop search engine that indexes all of your files and emails, meaning that you can search for them quickly and easily. This can be invaluable when you need to answer offbeat questions! Make sure your filing system is backed up. Again, this is a bit tedious, but it’s so important, as anyone who’s had a failed disk drive will testify! Make sure, firstly, that your PC is backed up regularly and, secondly, that the backup includes the directories where you file information. Take these approaches further by customizing your file management. This can help you prioritize your work, which can lead to better efficiency. Some people use version numbers to distinguish between documents that have been reworked or changed. Examples would be “Delta Traders contract v1” and “Delta Traders contract v2.” This also makes it easier to pick out the most current file. If your document is going to be looked at, used, or amended by several people, you need to be particularly careful about version control: people quite rightly can get very annoyed if versions are mixed up and their work on the document is lost. Make sure you put the version number in the file name here, and also consider having a version control table at the beginning of the document showing the version number, the date of the version, the person making changes, and, perhaps, the nature of changes made. Use “Tickler” files. Tickler files, also known as the “43 folders” method, are a unique system that’s used by many people for organizing files. Create 12 folders (one for each month of the year) and an additional 31 subfolders (for each day of the month). Fill each folder with the documents that you need to work with on that day. At the beginning of each day, open the folder for that day. Take all the items out of the folder and move them into a “today” folder or onto your desktop. Then move the empty folder into the corresponding slot for the next month. If you can’t complete some work items by the end of the day, transfer them to the folder for the next convenient day. This system of file management helps you keep track of everything you need to do, and it also doubles as a diary. For any system to be useful and effective, it must also be convenient for you. To some extent, this depends on the nature of your business or the work that you do. So, although there’s no “one size fits all” solution to file management, you will likely profit by using some of these file management tips, and by customizing them in a way that best serves your own needs. Are you losing too much time searching through the clutter on your computer for files that you need? And when you’re under pressure, can you retrieve information quickly and easily? Spending precious time looking for data can take the pleasure out of any kind of creative work you might be doing – and it adds to your stress levels as well. 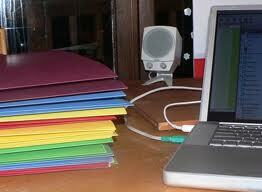 Simple good file management habits can hugely simplify your working life! Is paper taking over your home? Do you groan each time you check the mail? Are the contents of your children’s backpack waiting to take over your dining table? Help is available to control paper, and it may be simpler than you think. 1. Create a command center. 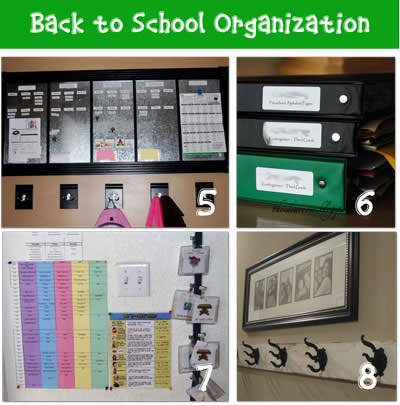 Create a regular place where all paper is kept. Mail is sorted here. Backpacks are emptied here. Receipts are deposited here. 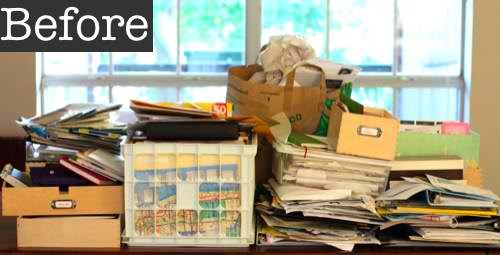 To make it a great command center, you’ll need a shredder, trash can, and at least a temporary filing system. 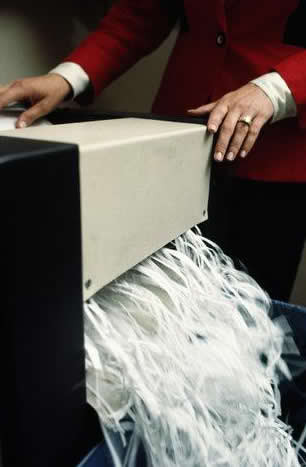 In just a few seconds, you’ll be able to sort paper into the shredder, the trash, or an action or archive file. Keep digital copies of what you can. Storing things on a computer takes up less space in your home, so when possible, store items digitally. I’ve tossed out my recipe box in favor of storing recipes online. The things I need are easier to find and they don’t take up additional counter space. Throw out paper that isn’t needed right away. Whether you recycle it, shred it, or trash it, throw out unnecessary forms, receipts, and letters right away. The command center comes in handy for this. Instead of moving piles of junk paper around, you’ll throw it away and forget it. 4. Have a filing system in place. Take the time to create a filing system that works for you. I have a set of temporary files, and a set of archived files. When paper comes into my command center, I can right away choose whether it’s something that should be trashed, archived, or requires action on my part. It’s filed accordingly. Before I had a shredder in my command center, I always ended up with a stack of papers to remember to shred later. Often that stack would get moved around and piled up with other papers, forcing me to re-sort. Having a shredder available is a huge time-saver. Just shred it and be done. If possible, go paperless with as much of life as you can. More and more companies offer paperless billing options. Even schools are beginning to communicate through email and webpages more frequently. Take advantage of paperless options wherever available and you’ll have less coming into your home. 7. Set a time/date to file and clean files. Depending on the size of your household and how much paper you receive, you’ll need to have a set time each week to file. I do mini-filing daily when I sort the mail and after school papers. Then weekly, I go through my action and archive folders in my command center and take care of those papers. Doing this regularly has gotten me into the habit of taking care of paper daily, and it’s made all the difference. Teaching your children how to file their own items will save you time. My children are already learning how to evaluate the paper that they bring into our home. They can make decisions on whether those papers need an action for me, need to be archived, or can be thrown out. 9. Put it on the calendar. Just like anything else you schedule, filing needs to be written as part of your daily plan. This is to help remind you that it’s an important part of your day. After awhile your routine will become…well, routine. But for now, writing it down in your daily planner will help keep you honest about keeping up with the influx of paper. Sorting paper can be a great chore to multitask with. I love going through files while I watch TV. It’s a great way to get something done and not feel guilty about spending time catching up on your favorite shows. Do not organize what you can toss! Are you overcome by papers but don’t know how long to keep them or if it’s safe to throw them away? Set aside 45 minutes and turn on good music. Get a bag or a recycle bin ready, and borrow a shredder if you don’t have one. It’s time to make some big progress. Go quickly through your house and throw away all the junk mail, expired coupons, catalogs, and old grocery lists that you see. Any little scribbled notes that you no longer need should be tossed. Take it one step further and prevent useless paper from entering your house in the first place. 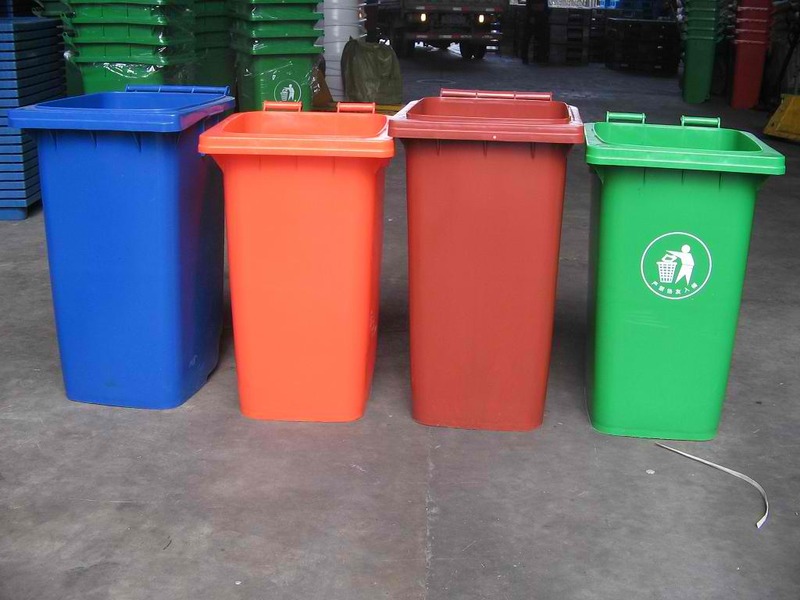 Open your mail over the recycle bin. Opt out of credit offers, and remove your name from catalog mailing lists. Save individual pages from magazines instead of the entire issue. Give magazines away to a friend or donate them to the local library. Put yesterday’s newspaper in the recycle bin. Cancel subscriptions for newspapers or magazines that you never get around to reading. You really don’t need more than three months of past bills that have been paid. If the company has a reputation for frequent billing errors then it might be worth keeping more, but otherwise it’s safe to toss them. Almost all other receipts can be tossed after you’ve checked your bank or credit card statement. Only keep the most recent few until you get the last one for the year. Then compare it to your W-2 before you toss it. I’d say this one is a personal judgement call. Most statements probably do not have long-term significance, but keeping them helps me to toss other paperwork. I can easily throw away paid bills and receipts because I know there is a record of them on the bank statement. You don’t need the monthly statements if you’ve received a quarterly or annual statement. It’s also fine to toss the Annual Report and Prospectus for an investment. Never toss a letter or document that confirms your right to a future retirement benefit. Keep maintenance records until you sell the car. When you get the new insurance card in the mail, throw away the expired cards. You don’t need to keep insurance paperwork that expired or that covered property you no longer own. Instead of storing a bulky directory of physicians, see if your insurance company lets you search online for network doctors. You can likely find the list of preferred prescriptions online as well. Keep medical bills for the current year, and then toss them if you don’t need them for tax deductions. Are you keeping old school notes or research papers just because you worked hard on them? (You’re not keeping them to show how smart you are, right?) Unless you actually use them in your current career, you don’t need them anymore. They have already served their purpose. Keep a small sample if you must, and then let go of the rest. If you have any warranty paperwork that is expired or manuals for appliances that you no longer own, give them a toss. What about cards, letters, and keepsakes? Papers with sentimental value are challenging just by themselves. I also want to share more ideas for going digital with paper storage. If you still have a lot more to clean out, that’s ok! Just take a look at how many papers you’ve ALREADY managed to toss. Later you can pick up right where you left off. How many junk drawers is too many? If you have too many here are some suggestions to tame the JUNK! 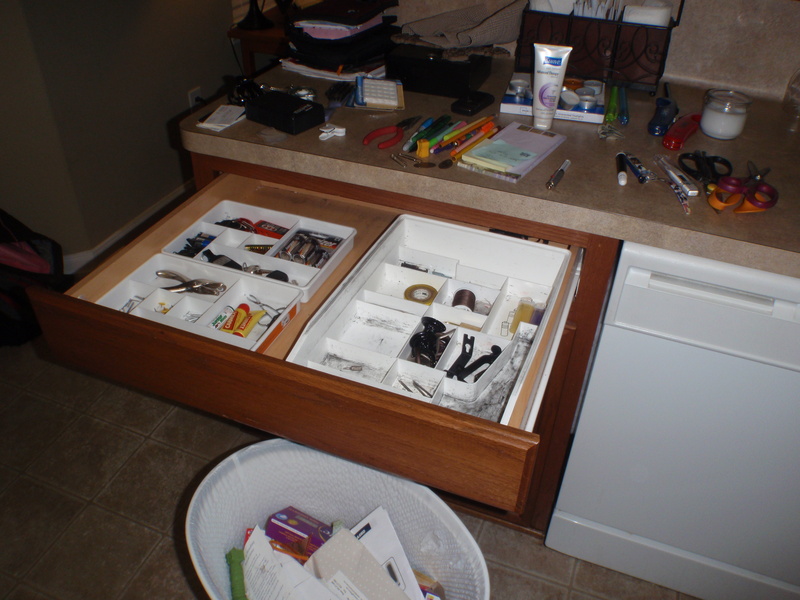 Remember that most of the items in the Junk Drawer are items that do not have a home or just put in there as a convenance. Try to establish a home for at least half of the items and then organize the rest. Go back monthly to get current items so that they do not get lost. 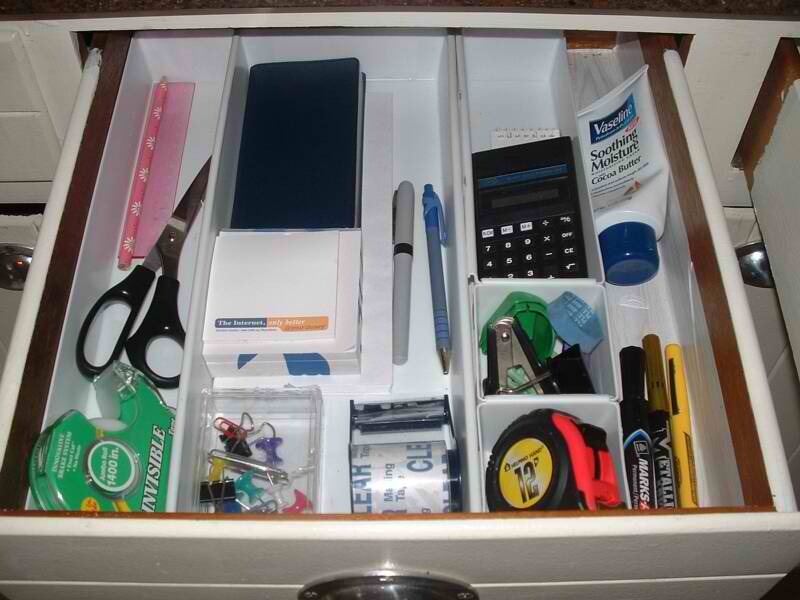 Keep each Junk Drawer very small-no bigger than the size of a shoe box. This will help eliminate lots of stuff and control what can and cannot fit. 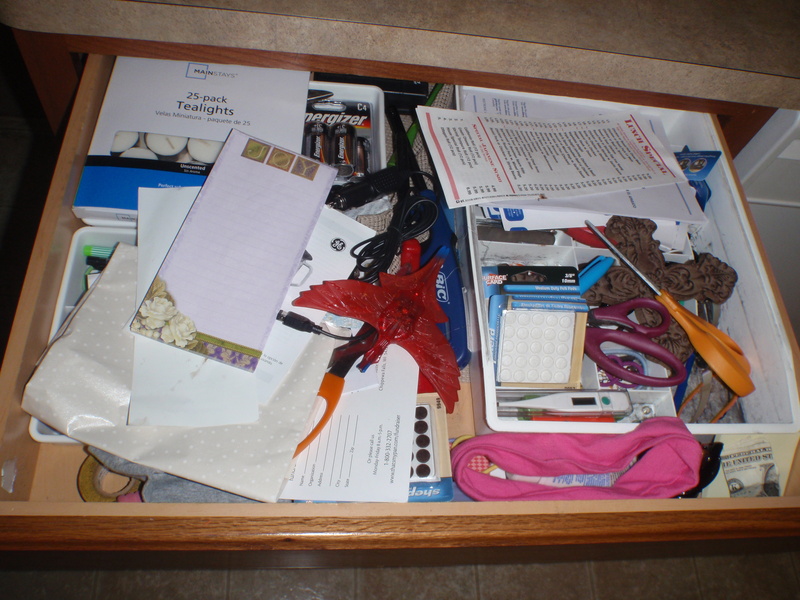 If possible label the drawer and Misc or Junk Drawer…sometimes the label is offensive, there is less Junk and usually becomes unnecessary. If trying to eliminate the number of Junk Drawers, start with the smallest one first. Then do not start a new one in that area. Once you get down to a few Junk Drawers, you will be able to declutter even more with less stress. If you only have one…keep the size small. You may want to resize the one you have but dumping the Junk Drawer into a show box and deciding what to keep and what not to keep. Basically less is best, and by cleaning out the drawer(s) several times a year (once every 3 months), even your Junk Drawer can be organized with purpose. Bottom line…You control the clutter or it will control you. So what is the answer? Here are some ideas to help! Toys: Broken items that cannot be fixed, haven’t played with for over a year or so, or no longer age appropriate. Magazines/Books: If they are no longer interesting, have expired over a year, damaged or just no longer need. Also you can tear out the pages that you need and file them and toss the rest of the book or magazine. Board Games: Pieces missing or no longer age appropriate. Stuffed animals: Multiples multiply so decrease. Ex. if you have 4 dogs…decreases by half, or at least one. Papers: if not art work or something work keeping, trash right away. May can transfer information on calendar or notebook then toss the paper. Take photos and put them on disk, then toss paperwork. Educational Items: Unless you are a teacher, look at the age on the container. If there are no children within 6 mths of that age, then toss. Art supplies: Dried up, broken, caps missing, no longer working –toss. Anything damaged. Puzzles: toss if pieces are missing. Clothes/Shoes: too small, too big, torn, worn or faded, have more than 5 (toss out oldest or the one that is not as new looking as the others. Use tossed clothing for siblings or donate asap. Sentimental items: Toss out items that are no longer needed. 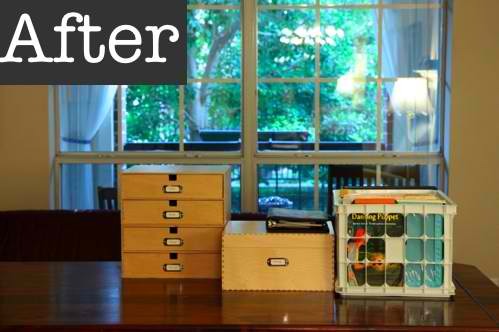 Use clear storage bins to store items to pass down. LABEL. 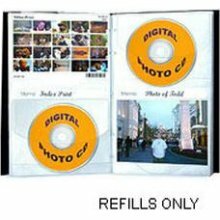 Take photos of things and put them in a scrap book or photo book and toss the items. Make a decision today for today. Simplicity is best! ~Don’t get overwhelmed on what you do keep. Keep like items together, find homes and enjoy! 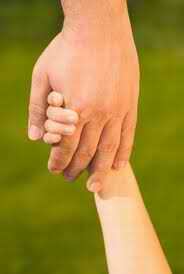 ~Donations are wonderful gifts to others. Churches and donation drop offs, are great places to start. ~If you are really still uncertain about an item…put it in a box. Label it as “THINKING.” Put them away for 30 days and see what you feel about them on day 31. You can continue this process until all items have a place or as you de clutter and clean other projects. Good luck and know that every thing you do is progress! 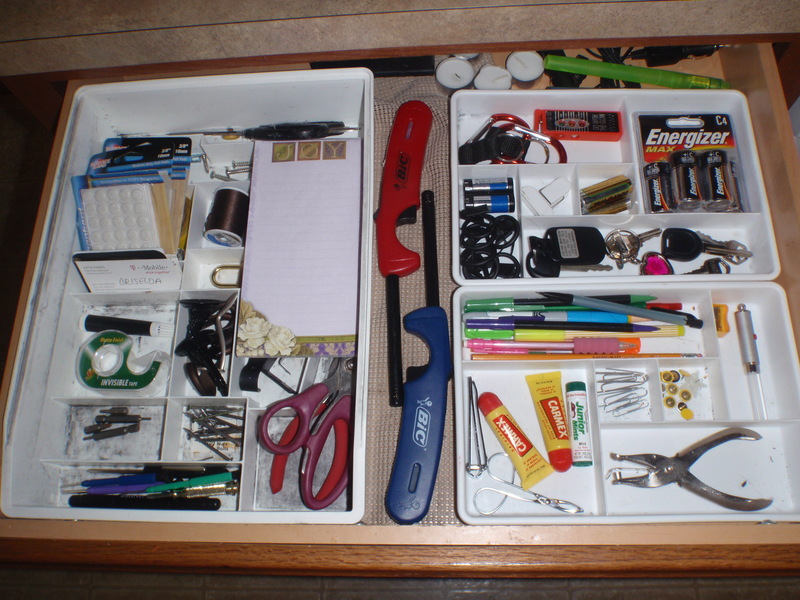 Junk Drawer–Yes we all have them!